Patti Strand, President of the National Animal Interest Alliance, has spent nearly 30 years attending America’s Family Pet Expo in Orange County, Calif. Instead of insisting that JQ Public meet purebred dogs only at dog shows, where most of us are too busy to actually interact with visitors, Strand says Pet Expo and other public venues are a great way to introduce our responsibly bred purebred dogs to folks in the community. Strand, along with her husband Rod, have been active in growing the participation of breed clubs at the Orange County event, which last year boasted 47,000 visitors. Representatives from more than 90 breeds had the opportunity to interact with those families, with long lines at most of the booths, Strand said. 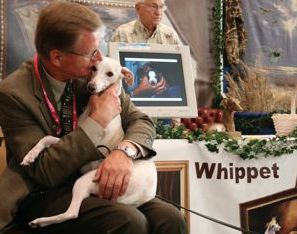 “… one of the things I’ve seen that’s pretty cool on the part of the breed clubs is how they’ve evolved over time, to now they have begun to create literature,” Strand said. “Maybe they had a brochure or a flyer to begin with, but now they have a lot more materials that they’re passing out and I think they’re finding it not only is a great place to educate or inform the public about their breeds but also they’re recruiting fanciers, people who love the breed. People who live in the area and had a Dalmatian or had a bulldog but didn’t know there was a club. 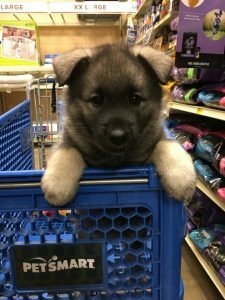 “… what we have found at the pet expos are the number of people who have our breed, who love our breed and really, really want to connect with other people who have the breed. So, if some of the memberships are a little smaller than the clubs would like them to be, this is really a great place to meet other fanciers of your breed that you never knew existed,” Strand noted. at the Orange County Fair & Event Center. Homes for Animal Heroes also is sponsoring a “virtual 5K run” to raise money for their goal to expand their fostering and adoption network to more states. Strand noted that public events like the Expo allow responsible preservation breeders to take back the conversation about animal welfare in the public dialogue. Patti Strand is a long-time Dalmation breeder who has been blazing the path of animal welfare and providing a voice for the rights of dog breeders for 25 years. And don’t forget! Listen to Allison Foley’s Leading Edge Dog Show Academy Tip of the Week on how to not lose your equipment at the dog show! Pure Dog Talk is the voice of pure bred dogs. We talked to the legends of the sport and give you the tips and tools to create an awesome life with your purebred dog. From showing to preservation breeding, from competitive obedience to field work, from agility to therapy dogs, and all the fun in between – your passion is our purpose. LAURA REEVES: Welcome to Pure Dog Talk. I am your host, Laura Reeves, and I am joined today by our very, very good friend Patti Strand from the National Animal Interest Alliance. Patti is going to talk to us today about something that I think is really pretty interesting information and stuff that I don’t know a lot of people know about, and it’s called Pet Expo and the opportunity that this presents us as purebred dog fanciers to reach out to the general public – is what you’re thinking, Patti? PATTI STRAND: Yeah thanks for the opportunity. My husband and I as it happens have been involved with the America’s Family Pet Expo that’s held every year in Orange County – I think it’s been going on now for 29 years. I have been to other pet expos. The goal or the reason that we became involved initially was so that there would be some sort of exposure to the purebred dog community, besides our dog shows. Because our dog shows we’re all pretty intensely involved with our breed, with our competition, or we’re putting on the shows – we don’t have a lot of time to really stand and talk to the various people who might come in the door there to meet purebred breeders. And we found that at pet expos, because of the way they’re set up and because much more casual atmosphere, it’s just been a real great venue for the purebred dog fancy to get their message out. PS: We work, as I mentioned, with the America’s Family Pet Expo in Orange County and it is just a gigantic enterprise. They have everything from reptiles to exotic birds and pretty much everything in between. They have the International Cat Association puts on demonstrations there, they have demonstrations of grooming which are very, very interesting to the general public. And then my husband and I have taken on the role of bringing in as many purebred clubs as we can, so that there will be purebreds there for the public to see and to talk to responsible breeders to get an idea of the people in their community that may be associated with a breed that they like. And I think it’s around 90 different breed clubs that we have now participating at the Orange County affair. Our last year, there were 47000 people who came through there <LR: Wow!> so this is like having a whole city – exposing your dogs to an entire city – 47000 people is enormous! I don’t think there are many dog shows in the country – even Westminster – that can boast a number like that. And the people in the booth – they set them up kind of like we do at Meet the Breeds – display, they decorate their booths, they have lots of material there about their breed, about how to raise them, if there’s grooming involved. PS: During the weekend we do a couple stage presentations where people actually bring their purebreds onto a stage and talk to a small audience that will gather for each of these presentations, and they will share information about their breed like their longevity – is a breed that is going to be with you for eight years? Or 10 years? Or 15 or 20 years? Is this period that is going to enjoy jogging with you or would they rather just lie at your feet in front of a fireplace? Are they lap dogs? But basically just giving general information about how to care for them, what their grooming requirements are, and those kinds of things. And the public really enjoys it. When you go through the various buildings you’ll see sometimes that there are lines of 12 to 20 people waiting to talk to breeders in a particular booth. For the last several years down at Orange County, AKC has actually had a booth too and they pass out all kinds of really useful information that is popular with the public. It is a very casual environment for all of these pet expos – whether it’s the one I’m talking about or ones that are out and about the country. They are family affairs, and you generally do see probably half of the crowd is husbands and wives but it’s husbands and wives and a lot of kids, too, who come through. They also have adoptions that are available there. Some of the rescue groups that are associated with the kennel clubs participate, there’s police dog demonstrations, so it just goes on and on – it’s just a lot of fun – a nice casual day. LR: Nice. So if one of our listeners is looking to become involved in something like this we’ll provide some links. But they’re available in different parts of the country through the course of the year is that correct? The pet expos? PS: Yeah that’s right and I don’t know if anybody has collected all of the links to all of the pet expos so that they can be gathered up and presented to everybody. We haven’t done that, so Laura maybe that’s something you’re going to want to do. PS: The World Pet Association – the organisation that puts on the big one down in Orange County – they have several other pet expos as well but some of them are oriented specifically to aquatics, for instance, and they’re not all wide-ranging like this particular one is with all the different species. I mean they even contests with chasing pigs and things like that. They have a race that consists of four pigs which run from one end of a 90 foot u-shaped track to the other – four dogs then compete in a similar race. Anyway they have silly stuff like that that’s going on. LR: Oh my gosh. But it’s fun for the general public. In my breed we participate in a lot of the Sportsman’s shows, so they’re selling hunting gear and they bring and have hunting dogs available and we would do that every year. When I lived in Seattle we did it every year as our club’s contribution to community education. And it was just a wonderful opportunity to interact with the community, for people to get to pet dogs, and have a positive association with purebred dogs. PS: Yeah it’s that casual atmosphere. I’m going to date myself here. It kind of reminds me of the early days when we had bench shows and people would sit around all day and talk dogs and all of the related subjects, and just a very fun casual outing. It’s a lot like that. I think this particular pet expo, it’s definitely one of the biggest in the country and it’s definitely one of the best in terms of just the diversity of offerings. And you definitely can spend an entire day there and enjoy yourself if you’re just coming in as a member of the public. And one of the things I’ve seen that’s pretty cool on the part of the breed clubs is how they’ve evolved over time to how they have begun to create literature. Maybe they had a brochure or a flyer to begin with, but now they have a lot more materials that they’re passing out. And I think they’re finding it not only is a great place to educate or inform the public about their breeds, but also they’re recruiting fanciers – people who love the breed, people who lived in the area and had a Dalmatian or had a Bulldog but didn’t know there was a club. So that’s been a very, very positive aspect of it as well. LR: Absolutely. And I can say what my experience has been that you have the experience with the Pet Expo. Talk to us, and for our listeners, if they’re going to participate in something like this – like a meet-the-breeds or a Pet Expo or the Sportsman’s Association or whatever it is – talk to us about the types of dogs that you want to encourage the fanciers to bring to engage with the community in that way. PS: Yeah that’s changed over time too, I tell you. It’s just a pleasure for me to go around to each of these booths and talk to the various club members that come. And they do bring just fabulous ambassadors of their breed to share with the public. And you see these dogs rolling over on their backs so that somebody can pet their tummy, and it is just a wonderful showcase for presenting ambassadors for their breed. I think when we first started and actually went out to a couple of other pet expos – and this might sound snobby, I do not mean it to be – but some of the purebred booths were not staffed. Some of the other expos that I went to, let’s say 15-20 years ago, by people who really did know the breed, they had the breed. They saw it as a fun exercise to go out. It must have been fun for them and I’m sure it did some good for the community too. But when you have the people who’ve spent their whole lives with these breeds, who are dedicated to know everything and more about them, they just have a ball sharing the information they have. And they certainly are able to educate the public better than people who didn’t have that expertise. LR: Right. And I think it’s important that we be able to incorporate our pet buyers but maybe team people up, right? Like here is one family who has one companion and they can talk about what it’s like to live with their one companion Dalmatian or Wirehaired Pointer, but team that person up with an experienced breeder – someone who may be able to give more in-depth background information if someone’s looking for that, that sort of thing. PS: Yeah you do find the different characteristics even within breeds depending upon the family. Like, I’m thinking about my breed again and we have, from the club that represents Dalmatians in Southern California, we have one person who’s very, very into all the different companion events and performance events. And she’s a top notch trainer and her dog is just on fire doing all these neat tricks for the public and when we go out and we do the presentations on the stage and so on. And some people go, “Oh, I don’t know, you know that dog as just a little bit too much energy for me.” But if they look like a foot and a half to the right, they’ll see somebody else’s dog that hardly wakes up during the whole time they’re there, but it’s just a sleepy time. So a lot of versatility within all of these breeds and people can, when enough dogs and people bring their dogs to these events, it’s a real opportunity for people to, like you say, to be able to make the match. LR: Absolutely. And I think one of the things that I always found really, really useful, when we were participating in these and also even when we were at bench shows – you know when we went to Chicago International and we’ve been at the Garden – the dogs really benefit from being up off the floor. Put them on a grooming table, put him on top of a dog crate, something like that. The dog is just more comfortable when you have those hordes and I’ve been there on Saturday afternoon when you’ve got 20 deep – I’m like oh my gosh <laughter> – I do think that that helps them. Has that been your experience as well? PS: Oh yeah it’s great socialization for the dogs. I don’t know if I’d bring a dog who hadn’t been anywhere in life before one of these, but for the average dog of any of these breeds they do very, very well. And they are better for the experience that’s for sure, in the end. You know each breed club has their own requirements as far as how the public interacts with them. We have some breeds whose dogs sort of drape the aisles and we have to tell them please take your dogs back inside. But they want the public to know that they can come up and pet them and comfortably lying around the aisle ways. And some of the Guardian breeds, their owners will ask you, you know, we want you to talk to us before you pet the dog, you know get our permission first which is standard dog etiquette I think, for the general public. But for all of these breeds regardless of how outgoing they are, how many times they have been exposed to the public, the experience is very good overall – they love it. PS: That’s great. She was popular I’m sure. LR: Oh she was very popular! PS: You know with a lot of our clubs our club members tell us that they don’t have the members that they used to have. I think really one of the things I’ve learned from participating in the pet expos is that it’s simply that they don’t know we exist because, as I mentioned a little bit ago, that is a big facet of what we have found at the pet expos, are the number of people who have our breed, who love our breed, and really, really want to connect with other people who have the breed. So if some of the memberships are a little smaller than the clubs would like them to be, this is really a great place to meet other fanciers of your breed that you never knew existed. LR: Absolutely and I think one point that I’d really like to make here, and I know this is going to be the case for the pet expos as well, this is not, “We’re going to go with a bucket full of puppies that we’re going to sell to some stranger on the street.” I think we need to make really clear that this is not about selling your litter of puppies – this is about meeting people and educating them about the breed. PS: Yeah none of the booths that have pure bred dogs sell from the booth – period. It’s prohibited. People are not allowed to bring puppies for sale. There is an adoption section. If you are in the adoption section because you rescue and so on, you can sign up for a certain kind of booth that will allow you to adopt dogs out. Many shelters and rescues do this. And then there’s also a section for rescues who are not placing dogs at the time of the show. Many of these are connected to the breed clubs. They’re not placing dogs at the time of the show, but they are acquiring lists of potential adopters for later in the year. And I think this is just a great service, again, for the various breed clubs and some of the breed clubs will talk about their rescue from their regular breed club as well. But it’s a great place to acquire lists for people who would like to adopt a dog of your breed, or to buy a dog at some subsequent time. But no, people are not bringing puppies to the show to sell. LR: Well it won’t hunt, but then it hasn’t been in a house and it hasn’t been crate trained and it hasn’t been socialized. It literally has no social skills. So we are often in need in my breed of Fosters who will help transition those dogs from backyard, neglected animals, to happy family companions that can go on and live great lives with new adopters. PS: Yeah absolutely. By the way, a group that is a program of National Animal Interest Alliance is Homes For Animal Heroes. And we will have a booth in the rescue section and we will be looking for foster homes for that program. LR: That’s awesome we had Cindy on after the conference in D.C. and she just has such a passion for that project. I just love it. PS: Yeah it’s very, very nice. It’s exciting. Well it’s growing like crazy. We do have a regional coordinator for Southern California, for Iowa, for Illinois, for Missouri, for Texas – I mean it’s growing every week it seems like we’re adding another state. We’re definitely going to run out of dogs. LR: But isn’t that a goal, Patti – run out of dogs? PS: For the people listening, it’s a program where we place dogs that have been involved with research. After their studies are done, they get to come home and be good pets. So for us we’re always looking for foster homes because these dogs are socialized, they love people, they’re used to being interacted with in a very positive way. But little things like they may not be used to a stairway, they may not be used to going potty on a particular surface. So it’s those kinds of things that we’re looking for foster homes to help us with before a final transition to an adoption home. LR: Now I know that your campaign is up, but I just wanted to put a plug in here for the National Animal Interest Alliance. You were doing some fundraising with an Amazon Smile campaign last month, were you not? PS: Yeah along with the rest of the world Amazon’s got it all. LR: But that was good. I saw a lot of people from within the purebred dog fancy really reacting to that, responding to that in a way that I don’t remember having seen in years past so I think that’s great. PS: Very good. And then did you see the launch on Run For Research Awareness that just came out two days ago? That’s our home page now. And that’s a 5k virtual run for Homes For Animal Heroes. LR: Awesome. I will definitely find that and get a link up on that. LR: No, don’t make it stop – you guys are doing fabulous! I think the biggest thing that I would like for Pure Dog Talk to be able to do for NAIA is just continue to hammer on that awareness. There are just way too many good dog people who have no clue that this exists. And if I can do my bit to put my two cents worth in, to support the people that are doing more than anybody else to defend purebred dogs and our right to own and breed them as we see fit, then we need to support NAIA. PS: Thank you. But we are the ones who do it best. So it’s kind of ironic that we’re fighting for our place in the conversation, isn’t it? I mean when you really think about the dog fancy as a whole, there are no other people in the world that give us much of their time, their love, their money, their energy, their intelligence to trying to make sure that dogs have good lives, that they’re able to live longer, that they are socialized well enough to live in the world comfortably, that, you know all the things that go into raising dogs. And then into just, you know, having this wonderful relationship available for us and for future generations. PS: It is ironic and sad that we have to fight for our position in the conversation informing the public about dogs. But that is the reality. We’ve just allowed ourselves to be replaced by, frankly, just the fundraising groups that make a dollar by telling sad stories or making claims about people like us who breed them. LR: Well, and erroneous claims 99.98% of the time. But I just want to make sure that listeners understand that NAIA is doing a lot of very good work to support us. LR: Oooh, teaser campaign! Well I will definitely have you back on the show and tell us about it at that time, Patti! Meanwhile, thank you so much for your time and listeners check it out see if we can find a pet expo near you. LR: We’ll put it up on our Web site, too, for people to be able to just directly click to it. LR: Very very good. Thank you so much, Patti. We’ll talk to you again soon. LR: All right, crew welcome back. We are here with Allison Foley from The Leading Edge Dog Show Academy. Allison brings us our tips of the week which we absolutely adore. Welcome Allison. ALLISON FOLEY: Hi, Laura – I hope you’re doing well today. LR: I am. I’m just spectacular. 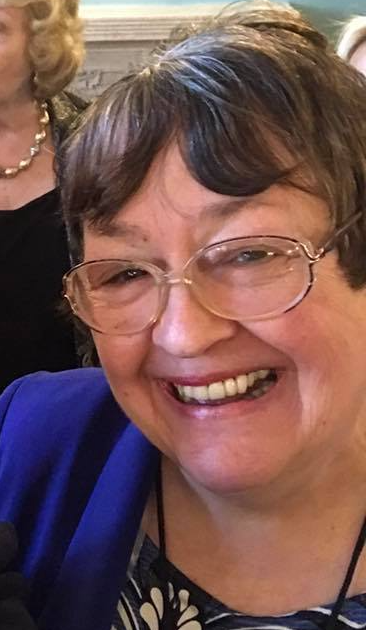 So what are we talking about today – what are we going to learn from Allison today? AF: Well today’s lesson – I don’t think it’s earth shattering or anything – but it is something that I have been doing like, all these past couple weeks, as kind of the show season really ramps up for me out here in Canada. So it’s something that I’ve been doing and something that I’ve had a lot of people kind of notice at the last dog show so I just thought I’d share that. AF: So I mean I do keep mine in the box. I am kind of crazy that way. But the other thing that happens is that we lose or misplace a lot of equipment. And I think that there’s, yes, sometimes in the heat of competition, you know we leave a brush or a comb or something at ringside and then we forget to pick it up. And then it’s in Lost and Found and then we forget, or somebody else picks it up – and not even really because they just want to scoff it, but more like a lot of us have the same equipment right? AF: So really take the time to mark your name on everything. AF: I mean I’m the sharpie queen. I use the sharpie on like all of my brushes. I use a labeler on my Combs or a nail polish on my combs and a labeler to mark the metal combs. But one of the things that I also do, because the thing is you know a lot of times we’re set up with people who are friends or mentors or some combination of that, and a lot of us have the same equipment because they’ll be like, “Hey have you tried this brush? This works so great,” so then all of your ten friends by the exact same brush. AF: And so one friend goes home with four and three friends go home with zero, right? It’s because you’re just, “Oh that’s my brush.” Throw it in your bag. So, the other thing I do is I tend to use vet wrap, like just the ordinary wrap we do ears and stuff, and I wrap my handles with it. So I kind of do it for like three different reasons – it’s comfortable when you’re doing a lot of brushing … so I show a lot of Poodles, and it gives you a lot of grip when you’re using chalk or other lotions or things or sprays, right? So it gives you a better grip on your brushes. And then, also, like, I don’t even really need to flip a brush over to see if my name’s on it because I know, even if all my friends wrapped them with vet wrap, we’re not all going to use the same color, right? AF: So I know my brushes are the ones with the pink vet wrap around the handles. So it seems easy but really if you’re saving twenty-five dollars a weekend because you haven’t lost a brush or a comb – that really adds up. AF: Yes. How true is that? LR: That’s absolute fact! And I love your suggestion of vet wrap because I used duck tape. I’m the duck tape queen, right? Like, I’m full on redneck! <laughter> I duck tape everything. But mine’s always the purple duck tape so I always know, but I like the vet wrap because of that comfort – because that duct tape can get slimy and it’s a pain to get off – and so the vet wrap is, I’m just thinking, genius here .. genius! AF: I started doing it, and I just had this slicker brush that I loved the brush part, but I didn’t like the handle. And then the handle started to crack. And so I just used vet wrap on it and then, ever since then, even comfortable handles are just more comfortable with vet wrap. LR: I like it. I like it. Well there you go. Leading Edge Dog Show Academy. Now you know why it’s the leading edge. Don’t forget to check out Pure Dog Talk 25, to get a 25 percent discount on Allison’s enormously fabulous services, and have a cup of coffee on us. So thank you Alison. LR: The Dog Show Superintendents Association is a proud supporter of Pure Dog Talk. Our dog shows superintendents are the hard-working people who make the dog show function. They are advocates for education and mentorship in the purebred dog fancy. S o stop by the Super’s desk at your next show. Tell them how much you love Pure Dog Talk and give them a shout out for their support. That’s all for today. Thank you for joining us on Pure Dog Talk.